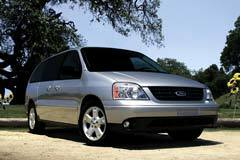 The Freestar was Fords attempt to maintain its fleet of minivans after they discontinued the Windstar in 2003. While Ford was marketing this vehicle as "all new,” it was, in fact, just a slightly modified version of its predecessor. With this in mind, if considering a used Ford Freestar you may also want to look into the 1995 to 2003 Windstar as well. One of the bigger differences in a used Ford Freestar will be its engine offerings. Two were available, a 3.9 liter 6 cylinder 193 horsepower for the SE model and a 4.2 liter V6 generating 201 horsepower on both the SEL and Limited trim levels. The SE came nicely equipped with power windows and locks, a CD player, air conditioning and even a keyless entry system all standard. The two superior models added climate controlled A/C, captain style chairs in its second row and a power driver’s seat. The Limited stood out with chrome wheels outside and leather upholstery inside. One of the best improvements on the Freestar verses the Windstar was a fold down 3rd seat as opposed to having to remove it entirely to increase the cargo capacity. The 135.7 cubic feet of storage area remaining was adequate. One of the drawbacks to buying a used Ford Freestar is its poor gas mileage. On the other hand, if this vehicle is for a family transporting the kids on a regular basis, it enjoyed an outstanding safety ranking by the National Highway Traffic Safety Administration.